DESIGNATED A LANDMARK IN 2012, THE GREYBAR BUILDING IS AN ART DECO ICON. The epicenter of East Midtown is Grand Central Terminal, one of the most recognizable transit hubs in the country and an iconic landmark that draws thousands of visitors weekly. It connects New York City to upstate New York, Connecticut and the other four New York City boroughs through multiple rail lines and subway trains, carrying commuters, residents and tourists alike. An abundance of retail, dining and fitness options are available within a fiFsqurve-minute walk of the station, and the neighborhood features the best that New York has to offer, including Bryant Park, the New York Public Library and easy access to countless museums along Fifth Avenue. It’s no wonder that companies continue to chase a Midtown address. In 2018, over 21 million square feet of office space was leased in Midtown, a 20 percent increase from the year before and the most in nearly two decades. 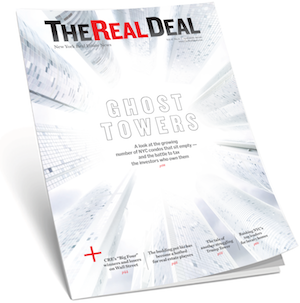 SL Green Realty Corp., New York City’s largest office landlord, is uniquely positioned to meet this growing demand. ATOP GRAND CENTRAL, 420 LEXINGTON BOASTS STUNNING AMENITIES AND AN UNPARALLELED LOCATION. Perhaps no building within SL Green’s portfolio reflects the quality of its holdings more than 420 Lexington Avenue, better known as the Graybar Building. The 31-story, 1.5-million-square-foot tower was originally constructed in 1927 by the architecture firm Sloan & Robertson. It is a stellar example of Art Deco style and is one of the sub-district’s key commercial properties, offering Class A office space, direct access to Grand Central and a rich history that adds to the city’s ever-changing fabric. 420 LEXINGTON PROVIDES DIRECT ACCESS TO AN ON-SITE EQUINOX FITNESS STUDIO. Timeless on the outside, the Graybar Building features modem amenities within. Since acquiring the building in 1998 and implementing a major restoration of the structure by the architecture firm Beyer Blinder Belle including construction of a new entrance canopy and storefronts, countless top-tier organizations call Graybar home, including New York Life Insurance, Metro-North Commuter Railroad Co. and Wolfe Research. 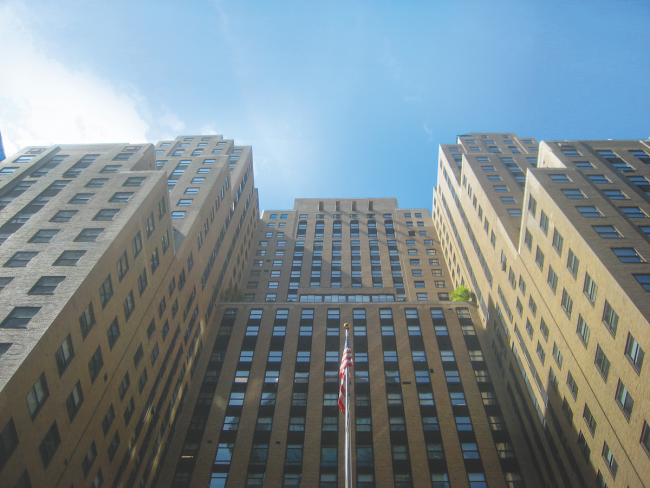 For restoring the building, SL Green won the 2019 Building Owners & Managers Association of Greater New York (BOMA) Historic Building Pinnacle award. The building now features 32 elevator cabs and large office floor plates, including direct access to an on­site Equinox fitness studio. The building has also received recognition for its commitment to sustainability. It is ENERGY STAR rated, LEED GOLD ­certified and a winner of the prestigious BOMA 360 award. Atop Grand Central, 420 Lexington boasts the Graybar Passage, an ornate walkway that connects the building with the world-class transit terminal. 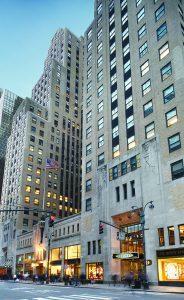 Designated a landmark in 2012, the Graybar Building is an Art Deco icon. Architects Sloan & Robertson incorporated several whimsical details in their design, including cast-metal rats that appear to hold up the canopies above the sidewalks. Sloan & Robertson also included baffles at the top of each cable, inspired by those that prevent rats from climbing aboard ships on mooring lines. On the building’s exterior are relief sculptures that depict earth, water, air and fire elements. The building’s interiors include polychromed ceilings, ornamental bronze grills, doors and fixtures, and wall and floor mosaics. Originally named after the communications and telephone firm Graybar Electric Company, it was one of the largest office buildings in the world when completed in 1927. 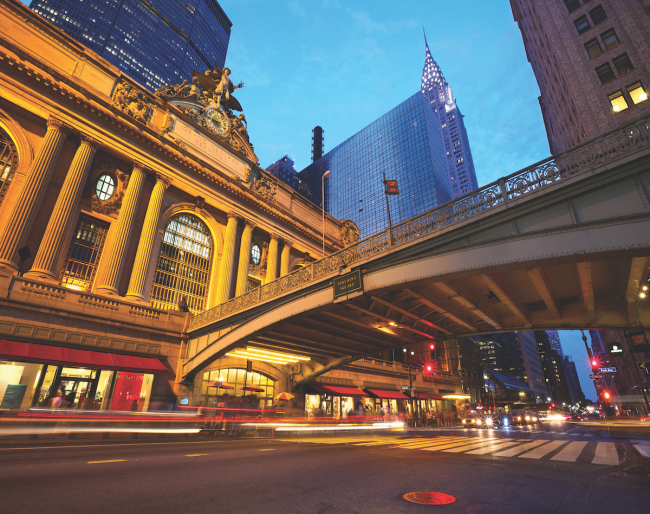 With stunning amenities and an unparalleled location, the Graybar Building epitomizes SL Green’s commitment to Midtown, taking advantage of all that Grand Central Terminal has to offer.